In July 2018, the first year of Magic Carpets came to an end. 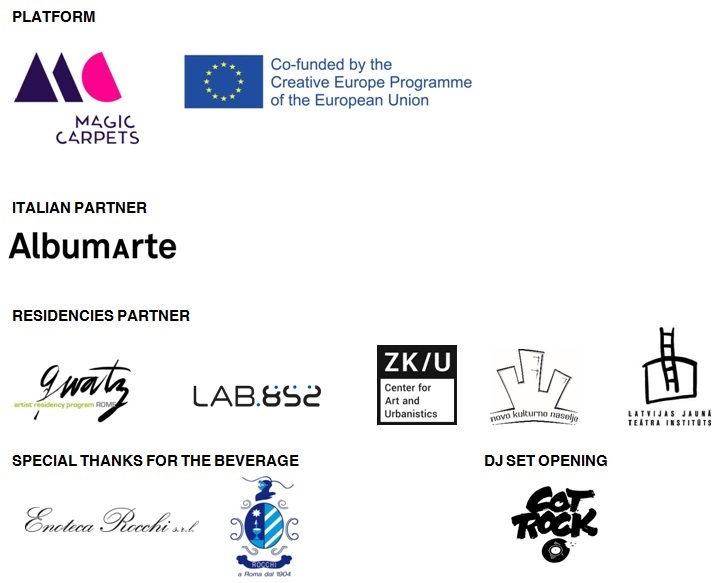 The international art project began with an idea from Benedetta Carpi De Resmini and was co-financed by the Creative Europe Programme (a European Commission programme to support the culture and audio-visual sectors), with the Kaunas Biennial as leading partner. Magic Carpets, developed with the collaboration of thirteen European partners, has the main goal of creating a dialogue between different nations through a programme of international artist’s residences and exhibits that give increased visibility to emerging talents: a project that aims to raise awareness about the concept of belonging, where the artists, outside of their home countries, can create a network of contacts, traveling and interacting with other realities and societies. The name of the project was an idea from Benedetta Carpi De Resmini – it’s a reference to the famous tales of One Thousand and One Nights and to the idea of the magic or flying carpet, a “fantastical device” to travel around the world in the blink of an eye. The creativity and imagination of Scheherazade, used to tell stories to intrigue and engage her husband, are here a convincing metaphor for the power of culture to transform mistrust and confrontation into intercultural dialogue, mutual understanding, respect and even love. Besides Latitudo (Italy), Magic Carpets features the participation of the Kaunas Biennial (Lithuania), head of the project and leading partner, and ZKU/KUNSTrePUBLIC (Germany), Folkestone Fringe (United Kingdom), New Theatre Institute of Latvia (Latvia), LAB 852 (Croatia), Prague Biennale (Czech Republic), EVA International–Ireland’s Biennial (Ireland), META Cultural Foundation (Romania), Centre of Contemporary Art (Georgia), Ideias Emergentes (Portugal), Novo Kulturno Naselje (Serbia) and Styleconception (Austria). On Monday, 17 September 2018 at 6.30 pm, AlbumArte and Latitudo will present, in the AlbumArte space, the project’s first exhibit in Italy, to conclude this first year of residences. The exhibit, The Others, is dedicated to works created by two artists during their time in Rome. The exhibit is also designed as a new edition of Exploring… STEP 2, a project curated by Benedetta Carpi De Resmini started at AlbumArte in January 2017 with the idea of analysing multiform works and different languages, to launch a new space for a mixture of art forms and new cultural exchanges. The two artists’ works are constructed around the symbolism of the non-place, of the home that doesn’t belong to us. The non-place, the sense of not belonging, is part of the private and collective affairs of each of us, and especially of those who migrate, who move from their place of origin, searching for fortune and a new life elsewhere. The theme chosen for the first year of Magic Carpets Italy is The Other, the Foreigner. The first two artists invited by the emerging curator Giulia Pardini (Latitudo) to discuss the topic of migration were Hrvoslava Brkušić (Croatia 1982), selected by the Magic Carpets partner Lab852 in Zagreb and Melanie Garland (Chile 1988), nominated by the partner ZK/U in Berlin. It’s not easy to deal with the recent history of our country, but this project must also address the reality that surrounds us at a difficult time. With this theme, we wanted to look at the phenomenon in its complexity and in its contradictions, through a profound reflection on what is happening around us, especially through the artists, who manage to analyse both the surface and the nucleus, both the roots and their branches. This attention marked the residences of both artists, who focused on the phenomenon of migration as well as on the individuals entering and crossing through our country in search of refuge. During the production phases of these residences, Latitudo encountered many artists, curators, writers, people who have been able to interpret the new expressions of discomfort and difficulty of living in this age and of the research of the artists discussing such a complex theme. Hrvoslava Brkušić, with her project A Voyage to the Mediterranean Sea, aimed to get to the roots of our history, analysing Italy’s colonial conquests, a period cancelled or nearly removed from the history of our country. The artist wondered if Italy had reckoned with its past, trying to create dialogue with a 16mm film shot in places that recall the colonial past, the sounds and the faces of contemporary Rome. In a difficult city, disinclined to open itself up to the Other, Hrvoslava tried to place herself in a position of listening, not only hearing, of fixing the sound of those that crossed the sea, returning to the roots, to the heart of the Mediterranean. Melanie Garland, instead, reflected on the condition of limbo that migrants find themselves in. In her work, too, a recurring element is water, the water of the sea and the water of the river that divides the city, as well as water that cradles those in limbo, seeking fortune. Her work, Liminality, which is marked by ephemeral elements like paper or light that interpret the fragility of the migrant condition, compares two different migrations: the historical migration of Italians toward America (especially Latin America), and the more controversial current migration of those on the shores of the Mediterranean. One of the project’s main goals is also to make our art known abroad: three Italian artists were invited by two European partners to develop residence projects linked to the location and local cultures, launching an open dialogue with communities. Grossi Maglioni, a duo of artists working together since 2006, participated in a residence with the Serbian partner Novo Kulturno Naseleje, where they developed their residence project by involving the local public. The other artist selected, Gian Maria Tosatti, was invited by the Latvian partner, New Theatre Institute of Latvia, to develop a public, site-specific work urging people to give renewed importance to public spaces. In the exhibit, a long timeline shows Hrvoslava Brkušić and Melanie Garland’s residences in Italy with photos by Luis Do Rosario. The photographer followed the artists during their stay in Rome, faithfully witnessing their research and encounters and managing, with photos, to give an idea of their trip to Italy. The timeline will also feature photos from the residences of Grossi Maglioni and Gian Maria Tosatti, kindly provided by the partners Novo Kulturno Naseleje and New Theatre Institute of Latvia, together with sketches, drawings and various materials, evidence of their research and inspirations, arranged in a long narration on the walls of the AlbumArte space.